I was born in the mid 1960's and in my teens I derived much pleasure from riding around the streets of a small country town called Busselton, Western Australia, on my Malvern Star 10 speed Sportstar. 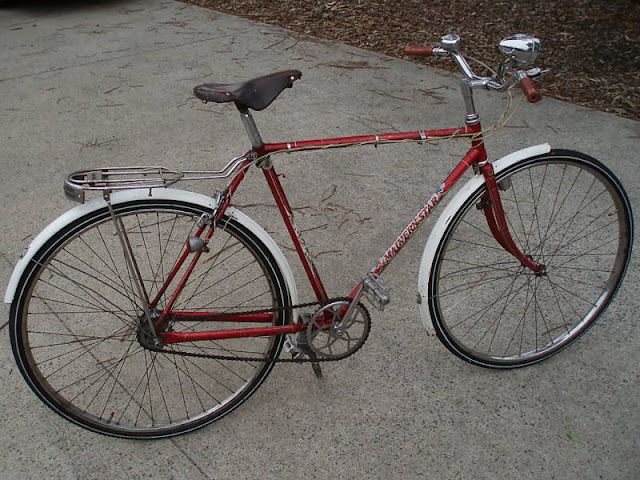 Since then I have always had a soft spot for the old Malvern Star bicycle.......and then a year ago I stumbled across this old mid 60's (probably 1965) Malvern Star 2 Star bicycle. I've always loved the 2 Star....a bit better that the 'single' star, a little bit rare, a little bit special, although not as sought after as the Malvern Star 5 Star. And in particular I've always liked the two star configuration on the head tube, not as busy as the head tube on the Malvern Star 5 Star......and all linked to a bit of Australian cycling heritage that was worth restoring!! The 5 Star head tube......beautiful but busy. 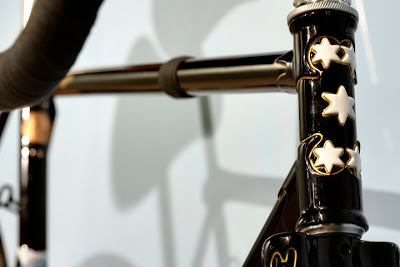 In the 1940's and 1950's the head tube of the 2 star looked great....two large stars for all to see (as below), and when painted up they do look stunning. Here's an image of a restored 2 Star with new decals courtesy of Greg Softley from Cyclomondo (decal reproduction) - have a look at his Flickr photo stream at http://www.flickr.com/photos/cyclomondo/................ absolutely stunning. Malvern Star 2 Star on gts753's photostream. 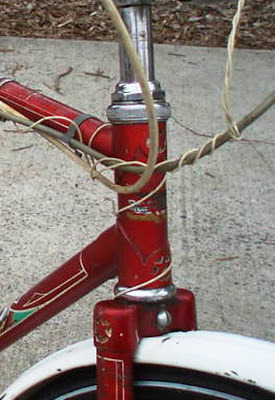 Then in the 1960's the 2 Star head tube took on a slightly different look as you'll see. The stars were a bit smaller, slightly more refined.....and so my endeavours began to transform the old girl pictured below. The 2 Star as I found her. The 1960's 2 Star head tube....with a more refined star design. ﻿﻿I initially stripped the bike down and took her apart carefully, taking photos along the way for later reference. Unfortunately the headset had split and was beyond repair, however everything else was OK. The original red paint wasn't too bad although I discovered that rust had started bubbling underneath the paint in places, so it really needed to be removed. I initially considered gently rubbing the frame back and clear coating it in an attempt to restore the original colour and decals, but it was too far gone! The frame was my main focus in terms of restoration....so I had it sandblasted and primed as below. 2 Star frame and forks. 1960's 2 Star head tube with primer. After sandblasting and priming the frame I had it stored in the back room for the following 6 months.....due to family and work a committments finding time to do any further work was difficult. Then last month I finally had a chance and took the frame out for some further attention. Firstly I obtained the reproduced Malvern Star 2 Star decals from Greg Softley at Cyclomondo (an eBay store). These decals are fantastic, perfect decal reproductions that are easy to apply - and inexpensive too! After a considerable amount of contemplation and planning I went to my local paint store and grabbed a color card (swatch) of the colour I wanted to paint the frame and took the swatch and my primed frame to my local auto panel beaters for painting. After much discussion with the auto paint man it was decided that the paint should be two pack - a strong durable clearcoated auto finish that will last for years. After the initial coat of paint I was given the frame back so I could apply the decals and paint up the features on the frame myself. After making sure it was painted up nicely I returned the completed frame to the auto shop for a final clearcoat......and here is the result. ....and after fitting the headset. I don't have much room in my house and was initially going to hang the finished frame on the wall, but after coming this far I really would like to build her up and ride off into the sunset......and when I do build her up I'll post some images in a 'Part 2' sequel. I love the detail you went to with painting the stars! Great colour selection! Looks very beautiful! I just want to say Thank You from the bottom of my heart, for this page with useful information.Sunfull information provide support and encouragement to people like us after reading this blog.There are always two sides of sites and blogs, it's best to get both sides before you make any decision.Thku!!!!!! !